1Associate Professor, Brucellosis Research Center, Department of Infectious Diseases, Hamadan University of Medical Sciences & Health Services, Hamadan, Iran. 2Assistant Professor, Department of Infectious Diseases, Hamadan University of Medical Sciences & Health Services, Hamadan, Iran. 3General Practitioner, School of Medicine, Hamadan University of Medical Sciences & Health Services, Hamadan, Iran. 4Assistant Professor, Department of Community Medicine, Hamadan University of Medical Sciences, Hamadan, Iran. *Address correspondence and reprints request to: Fariba Keramat, Associate Professor, Brucellosis Research Center, Department of Infectious Diseases, Hamadan University of Medical Sciences & Health Services, Hamadan, Iran. Objectives: Tuberculosis is one of the oldest infections known to affect humans. The aim of the study was to assess the quality of life including physiological, general health perception and social role functioning among patients with tuberculosis in Hamadan, Western Iran. Methods: A cross sectional analytical study was conducted between December 2009 and March 2011, the quality of life scores of 64 tuberculosis cases were measured by SF-36 questionnaire before treatment, after the initial phase and at the end of treatment and were compared with those of 120 controls. The association of the quality of life with age, type of tuberculosis, sputum smear, duration of disease, and the stage of treatment were assessed among the patients. Results: Before treatment, all scores of tuberculosis patients were lower than those of the controls (p<0.05). The patients’ score increased significantly after two months of treatment (p=0.01), but the difference was not significant between two and six months after treatment (p=0.07). The lowest score in tuberculosis patients was related to physical functioning and energy (45 ± 42, 44 ± 24, respectively). Conclusion: According to the results, tuberculosis patients still have a low quality of life in spite of receiving new care strategies. Therefore, enhancement in quality of life may improve adherence to anti-tuberculosis treatment, functioning and well-being of patients with tuberculosis. Keywords: Tuberculosis; SF-36 Questionnaire; Quality of life. 1Department of Physiology, King George's Medical University, (Erstwhile Chhatrapati Shahuji Maharaj Medical University), Chowk, Lucknow, Uttar Pradesh, India 226003. 2Department of Medical Genetics, Sanjay Gandhi Post Graduate Institute of Medical Sciences, Rae Bareli Road, Lucknow, Uttar Pradesh, India 226014. 3Department of Pediatrics, King George's Medical University, (Erstwhile Chhatrapati Shahuji Maharaj Medical University), Chowk, Lucknow, Uttar Pradesh, India 226003. 4Department of Cardiology, King George's Medical University, (Erstwhile Chhatrapati Shahuji Maharaj Medical University), Chowk, Lucknow, Uttar Pradesh, India 226003. 5Department of Pathology, King George's Medical University, (Erstwhile Chhatrapati Shahuji Maharaj Medical University), Chowk, Lucknow, Uttar Pradesh, India 226003. *Address correspondence and reprints request to: Neena Srivastava Department of Physiology, King George's Medical University, (Erstwhile Chhatrapati Shahuji Maharaj Medical University), Chowk, Lucknow, Uttar Pradesh, India 226003. Objective: Genetic variants of the melanocortin-4 receptor gene (MC4R), agouti related protein (AGRP) and proopiomelanocortin (POMC) are reported to be associated with obesity. Therefore, the aim of this study is to examine MC4R rs17782313, MC4R rs17700633, AGRP rs3412352 and POMCrs1042571 for any association with obesity in North Indian subjects. Methods: The variants were investigated for association in 300 individuals with BMI ≥30 kg/m2 and 300 healthy non-obese individuals BMI <30 kg/m2. The genotyping were analyzed by Taqman probes. The statistical analysis was performed by the SPSS software, ver.19 and p≤0.05 was considered statistically significant. Results: The genotypes of MC4R rs17782313 and POMC rs1042571 were significantly associated with obesity (C), (p=0.02; OR=1.7 and p=0.01; OR=1.6, respectively); however, MC4Rrs17700633 (p=0.001; OR=0.55) was associated with low risk. In addition, AGRPrs3412352 (p=0.93; OR=0.96) showed no association with obesity (BMI ≥30 kg/m2) in North Indian subjects. Conclusion: This study provides the report about the significant association of MC4R (rs17782313) and POMC (rs1042571) with morbid obesity (BMI ≥30 kg/m2), but MC4R (rs17700633) and AGRP (rs34123523) did not show any association with obesity in the studied North Indian population. Keywords: Obesity; Genetic variants; Genotype; Phenotype; MC4R; AGRP; POMC. 1Pediatric Endocrine Unit, Department of Child Health, Sultan Qaboos University Hospital,P.O. Box 38, P.C 123, Al-Khoud, Sultanate of Oman. 2Department of Child Health, Sultan Qaboos University Hospital,P.O. Box 38, P.C 123, Al-Khoud, Sultanate of Oman. 3Diabetic Nurse, Pediatric Endocrine Unit, Department of Child Health, Sultan Qaboos University Hospital,P.O. Box 38, P.C 123, Al-Khoud, Sultanate of Oman. *Address correspondence and reprints request to: Irfan Ullah, Pediatric Endocrine Unit, Department of Child Health, Sultan Qaboos University Hospital,P.O. Box 38, P.C 123, Al-Khoud, Sultanate of Oman. Objectives: To describe the demographic characteristics and clinical presentation of Omani children with type 1 diabetes mellitus at Sultan Qaboos University Hospital, Muscat, Oman. 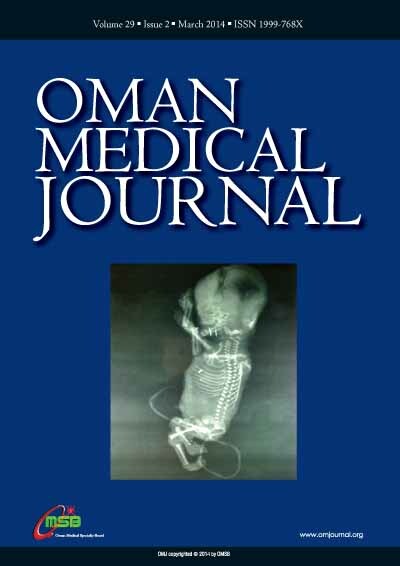 Methods: A retrospective analysis of all children with type 1 diabetes mellitus attending the Pediatric Endocrine Unit at Sultan Qaboos University Hospital, Oman from June 2006 to May 2013. Results: One hundred and forty-four patients were included in the study. The mean±SD of age at diagnosis was 6.7 ± 3.7 years. The median duration of symptoms was 10 days (IQR; 5-14). The most commonly reported presenting symptoms were polyuria (94%), polydipsia (82%), and weight loss (59%). Diabetic ketoacidosis at initial presentation was diagnosed in 31% of the patients. Different insulin regimens were prescribed: multiple daily injections in 109 (76%) patients, twice daily insulin regimen in 23 (16%) patients, and insulin pump therapy in 12 (8%) patients. Family history of type 1 diabetes mellitus was present in 31 (22%) patients. There were no significant differences in presenting complaints (polyuria, p=0.182; polydipsia, p=0.848), duration of symptoms (p=0.331), reported weight loss (p=0.753), or diabetic ketoacidosis at presentation (p=0.608) between patients with and without family history of type 1 diabetes mellitus. Conclusion: Polyuria, polydipsia and weight loss are the most common presenting symptoms. Family history of type 1 diabetes mellitus is highly prevalent among the studied patients. Diabetic ketoacidosis was found to be less common in Oman compared to other diabetes centers in the Middle East. Keywords: Type 1 diabetes mellitus (T1DM); Children; Family history; Diabetic ketoacidosis (DKA); Insulin; Oman. *Address correspondence and reprints request to: Zatollah Asemi Research Center for Biochemistry and Nutrition in Metabolic Diseases, Kashan University of Medical Sciences, Kashan, I.R. Iran. Objective: Micronutrient deficiency during pregnancy is associated with several complications. This study was designed to determine the effects of received multivitamin-mineral vs. multivitamin supplements on maternal, newborns' biochemical indicators, and birth size. Methods: This double-blind randomized-controlled clinical trial was conducted among 48 Iranian pregnant women, primigravida, aged 18-35 years old in their second and third trimester from December 2011 to September 2012. Subjects were randomly assigned to receive either the multivitamin-mineral (n=24) or multivitamin supplements (n=24) for 20 weeks. Fasting blood samples were taken at baseline and after a 20-week intervention of pregnant women as well as umbilical cord blood of the babies immediately after delivery to measure serum calcium, vitamin D, iron, magnesium, zinc and biomarkers of oxidative stress including plasma total antioxidant capacity and total glutathione. Results: Multivitamin-mineral compared to multivitamin supplementation resulted in a significant increase in maternal serum calcium (0.5 vs. -0.1 mg/dL, p=0.04) and magnesium levels (0.1 vs. -0.2 mg/dL, p<0.001). Furthermore, mean plasma total glutathione levels (1791 ± 566 vs. 1434 ± 622 µmol/l, p=0.04) of the newborns whose mothers received multivitamin-mineral were higher than those whose mothers received multivitamin supplements. Conclusions: Overall, multivitamin-mineral compared to multivitamin supplementation for 20 weeks during pregnancy resulted in a significant increase in maternal serum calcium and magnesium levels as well as a significant elevation of newborn plasma total glutathione levels. Keywords: Micronutrient; Supplementation; Pregnancy outcomes; Oxidative stress. Department of Medicine, Faculty Office Building, Aga Khan University Hospital, Karachi, Pakistan. *Address correspondence and reprints request to: Sadia Masood, Department of Medicine, Faculty Office Building, Aga Khan University Hospital, Karachi, Pakistan. Autoimmune diseases are known to have association with each other but it is very rare to see multiple autoimmune diseases in one patient. The combination of at least three autoimmune diseases in the same patient is referred to as multiple autoimmune syndrome. The case we are reporting features multiple autoimmune syndrome with five different conditions. The patient had type 1 diabetes mellitus, autoimmune hemolytic anemia, systemic lupus erythematosus, vitiligo, and psoriasis. Psoriasis has rarely been reported previously under the spectrum of autoimmune syndrome. Although the relationship of autoimmune conditions with each other has been explored in the past, this case adds yet another dimension to the unique evolution of autoimmune pathologies. The patient presented with a combination of five autoimmune diseases, which makes it consistent type three multiple autoimmune syndromes with the addition of psoriasis. The current case is unique in this aspect that the combination of these five autoimmune disorders has never been reported in the past. Keywords: Autoimmune syndrome; Vitiligo; Psoriasis; Hemolytic anemia; Diabetes; Systemic lupus erythematosus. 1Department of General Surgery, Nizwa Hospital, Sultanate of Oman. 3Department of Gastroenterology, Nizwa Hospital, Sultanate of Oman. *Address correspondence and reprints request to: Palankezhe Sashidharan, Department of General Surgery, Nizwa Hospital, Sultanate of Oman. Advances in the identification of gastrointestinal stromal tumors, its molecular and immunohiostochemical basis, and its management have been a watershed in the treatment of gastrointestinal tumors. This paradigm shift occurred over the last two decades and gastrointestinal stromal tumors have now come to be understood as rare gastrointestinal tract tumors with predictable behavior and outcome, replacing the older terminologies like leiomyoma, schwannoma or leiomyosarcoma. This report presents a case of gastric gastrointestinal stromal tumor operated recently in a 47-year-old female patient and the outcome, as well as literature review of the pathological identification, sites of origin, and factors predicting its behavior, prognosis and treatment. Keywords: Gastrointestinal stromal tumor; Identification; Risk stratification; Management. 1Department of Orthopaedics,All India Institute of Medical Sciences, Ansari Nagar,New Delhi1100029,India. *Address correspondence and reprints request to: Department of Orthopaedics,All India Institute of Medical Sciences, Ansari Nagar, New Delhi1100029,India. A 25-year-old male presented with complaints of abdominal pain for the past two months. He was prescribed Buscopan and omeprazole by a general surgeon. It was only when patient started complaining of backache that he was referred to an orthopedic surgeon. On examination of spine, there was tenderness at the upper dorsal spine. A diagnosis of Pott’s disease affecting the upper dorsal spine was made. Magnetic resonance imaging (MRI) confirmed the vertebral changes and showed subligamentous spread of paravertebral masses from D2 to D7. This case illustrates the unusual form in which spine tuberculosis can present. High index of suspicion is necessary for early diagnosis and prompt management. General surgeons should be aware of this atypical presentation of Pott’s disease. Keywords: Tuberculosis; Spine; Pott’s spine; Abdominal pain. 1Intern, ENT Division, Department of Surgery, Sultan Qaboos University Hospital, P.O. Box 38, PC 123, Al Khoud, Sultanate of Oman. 2Senior Registrar, ENT Division, Department of Surgery, Sultan Qaboos University Hospital, P.O. Box 38, PC 123, Al Khoud, Sultanate of Oman. 3Consultant, Department of Pathology, Sultan Qaboos University Hospital, P.O. Box 38, PC 123, Al Khoud, Sultanate of Oman. 4Consultant, ENT Division, Department of Surgery, Sultan Qaboos University Hospital, P.O. Box 38, PC 123, Al Khoud, Sultanate of Oman. *Address correspondence and reprints request to:Senior Registrar, ENT Division, Department of Surgery, Sultan Qaboos University Hospital, P.O. Box 38, PC 123, Al Khoud, Sultanate of Oman. Intraoral schwannoma is a rare entity. Tongue has been reported as the most common oral site. Those involving salivary glands are unusual and parotid gland is the usual site. Literature search revealed only one case of schwannoma involving the sublingual gland. Hence, this is a presentation of another case of sublingual gland schwannoma with a review of literature, in a young female of 21 years old. Keywords: Schwannoma; Mouth; Sublingual gland; Case report. 1#138, Lane no. 6, New Jawahar Nagar, Batala Road, PO Khanna Nagar, Amritsar. Pin no. 143001. 2Department of Physiology CMC&H, Pathankot. 3Department of Microbiology CMC&H, Pathankot. *Address correspondence and reprints request to: Vishal Gupta, #138, Lane no. 6, New Jawahar Nagar, Batala Road, PO Khanna Nagar, Amritsar. Pin no. 143001. Objective: Malaria is today one of the major causes of human suffering, both in terms of increasing morbidity/mortality and stunting intellectual/ economic growth. In a developing country like India, it has devastating socioeconomic consequences. The present study was therefore carried out to study the epidemiology of malaria in Amritsar district. Methods: Diagnosed cases of Malaria reported from 1st January to 31st December 2009 in the erstwhile District of Amritsar were collected from the District Epidemiologist of Amritsar and Taran Taaran and studied. A total of 314 patients were studied. Data was assessed, systematically compiled and statistically analyzed. Conclusion: The people living in rural areas were found to be more vulnerable to malaria. The disease was found to be more prevalent among the lower socio economic strata and young population leading to considerable adverse effect on health and economy. Our study aims to stress the estimation of the true burden of malaria. Keywords: Epidemiology; Amritsar; Malaria; India. What could be the Diagnosis in this Patient?